The scattered pieces of a large distillation train, probably for the production of spirit of wine, are of special note among the inventory's entries. The first piece is the distilling kettle, in which the materials to be distilled were placed. Curiously, the person making the inventory confused this with a furnace, for he listed "a copper furnace or small distilling pot," which might be a fault either of nomenclature or unfamiliarity with the technical apparatus. Next is a "round copper helm" to attach above, and a "copper distillation bath" to go underneath, which was filled with sand, ashes, or water to provide a gentle, even heat for distilling. Then we find "a softwood vat lined with lead and wrapped with twelve copper bands, serving for the distillation of herbs." This tub would have been filled with water to cool and condense the distillate. The distilling coil that should have fit into this tub is missing from the laboratory; however, a search of the inventory reveals in the small beer cellar "an old barrel with a copper distilling coil." Its presence there links the two rooms, probably because the wine made in the beer cellar was used for the production of spirit of wine. Indeed, such a "distillerslange" (or "Kühlschlange" in German) was designed specifically for the distillation of alcohol, which, being more volatile than waters or oils, greatly benefited from external water-cooling to prevent the loss of product. Perhaps a portable furnace and distilling train was occasionally brought to the small beer cellar to make spirit of wine, which may have been easier than toting large quantities of wine to the attic, and then hauling the watery distillation residue (about 70-80% of the weight of the wine) back downstairs to be discarded. 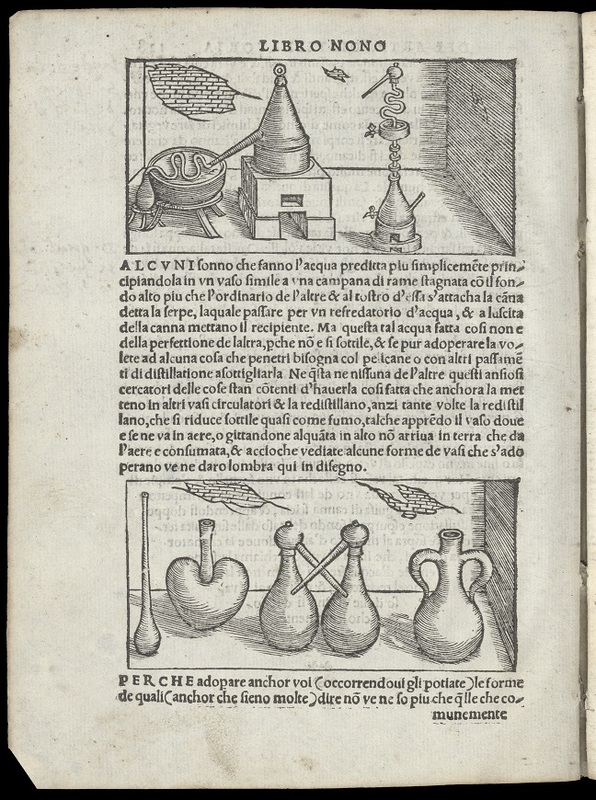 Distillation Equipment, from Vannoccio Biringuccio, De la pirotechnia, Venice: 1540.